Clearly that statement was made in pure jest. 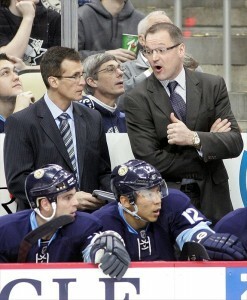 Under no circumstances do I think that the bench boss of the Pittsburgh Penguins should be handed his walking papers. Allow me to pose a question: Can you name the six defensemen who played for the Penguins on Monday night against the Toronto Maple Leafs, and then again last night against the New York Rangers? Perhaps a more difficult query for those looking for a REAL challenge: Can you name more than five Penguins’ forwards who played in the two previously-mentioned games NOT named Crosby, Kunitz, or Dupuis? Matt Niskanen and 19 year-old Olli Maatta paired up to form the team’s top defensive unit in both games. Robert Bortuzzo – by many accounts (mine included) – played BY FAR his best game of the season in Monday evening’s tilt with the Leafs while paired with Wilkes Barre/Scranton call-up Brian Dumoulin. Coincidentally, that was also Dumoulin’s first professional game. Simon Despres, who got the call-up earlier in the season, skated alongside another NHL newbie (and son of former Pens’ defenseman Ulf) Philip Samuelsson. Consider this: at the beginning of the season, a 19 year-old played his way into a starting, everyday spot on the Pittsburgh Penguins’ blue line. He was paired with a guy in Matt Niskanen whom many thought would be the odd man out due to salary cap constraints. Now, these two are the Pens’ top pairing on the back end, and they’re not just holding down the fort. They’re excelling. Niskanen now leads the team in ice-time, having averaged nearly 25 minutes a game the past five contests. And what more can be said about Maatta? He’s 19, playing a prominent role on a team widely favored to win the Stanley Cup this season. Then there is Robert Bortuzzo. A guy who, when Rob Scuderi went down with a broken ankle 10 games into the season, couldn’t beat out Deryk Engelland for that sixth spot on the defense corps (and I, for one, am not complaining one bit). Then, when Paul Martin caught the injury bug with a broken tibia, the Penguins called up the oft-maligned Simon Despres to fill the roster spot. Next was Kris Letang to bite the injury bullet with an upper-body ailment, and the Pens chose to bring up Brian Dumoulin. But Dumoulin was a healthy scratch during the first few games of his inaugural NHL stint, in favor of Bortuzzo. And “Borts” has answered the bell admirably. The fact is this: right now, the Pittsburgh Penguins are down their top four defensemen from the beginning of the season, and Deryk Engelland was the seventh guy on the depth chart. All they’ve done is win 11 of their last 12 games. That’s a HUGE tribute to Dan Bylsma and the rest of the coaching staff. Quite frankly, I think the credit due to Bylsma stems more from what this group has done, more so than the defense. I doubt I’ll get any argument when I say that the organizational depth and talent along the blue line is this team’s strength. None of us, myself included, thought that this team would win as frequently as they have been (knock on wood) lately, with injuries to Evgeni Malkin and Beau Bennett, plus a suspension to James Neal (who, by the way, will return tonight against the Minnesota Wild). Add the early-season injury to Chuck Kobasew, along with Tanner Glass’ broken hand, and we’re talking about five regular forwards out of the lineup for extended an period of time. Now insert guys like Chris Connor, a player who was never drafted, and yet – as Eddie Olczyk mentioned during the Penguins-Rangers broadcast last night – has never been traded, either. Jayson Megna; he played at the college hockey hotbed of The University of Nebraska at Omaha. Andrew Ebbett; a guy who had never gotten a shot at the big time and had spent his entire professional career (seven years worth) mired in the AHL. And finally, Brian Gibbons, who – like Ebbett – had never been given a chance in the NHL until this season. Unfortunately for two of those guys (Megna and Ebbett) the injury bandwagon haunting the Penguins found them as well. Ebbett broke his ankle blocking a shot during a penalty kill situation in just his third NHL game. Megna was leveled along the boards in Monday’s game against Toronto and is out with an upper-body injury. I’ve been belly-aching since last season’s unceremonious exit from the playoffs that Bylsma and his staff need to be able to adapt on the fly. Improvise when a team is clearly and easily beating his system on a given night. With all of these injuries (and the two suspensions) the Penguins have had no choice but to alter their style a bit. 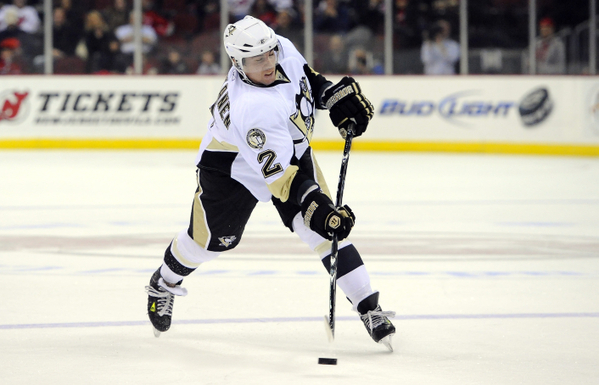 For the time-being, gone is the run and gun, “get north” attitude of the Pens’ forwards. Now, it’s more of a muck and grind, take-the-ice-your-given, patient style of play that is conducive to basically having the equivalent of an AHL team playing at the NHL level. Face it (and I’m not telling you anything you don’t already know here), guys like Connor, Megna, Gibbons, they aren’t as talented as Malkin, Neal, and Bennett. Nor are the likes of Despres and Bortuzzo as talented as Letang, Martin, Scuderi, et al. Byslma, Tony Granato, Todd Reirden, and Jacques Martin have done a masterful job of reinventing the Pittsburgh Penguins during these trying times. In the days and weeks that followed the announcement of the contract extensions for the entire coaching staff; had you told me that the Penguins would be facing injuries and suspensions to key players, yet would have won 10 of their past 11 contests, I would have asked for the same prescription that you’re currently taking. Or I simply would have asked what your diet consisted of, that would make one so delusional. Yet here they are. Perched atop the Metropolitan Division and , more importantly, the Eastern Conference. Without the league’s leader in assists (Malkin), without a 40-goal scorer (Neal), and minus their top four defensemen (Letang, Scuderi, Orpik, Martin). What Bylsma and this coaching staff have done over the past few weeks is nothing short of remarkable. And I do believe that they are earning every cent of those contract extensions. And keep those questions coming for the next installment of the Penguins/THW Mailbag! !